Hocking Valley Class A-1 No. 201 taken at Columbus in 1925. Photo from the Edward H. Miller Collection. The greatest auction sale in the history of Columbus took place on February 24, 1899, in the barn-like shed of the Columbus, Hocking Valley and Toledo freight station at 110 West Maple Street. Present that day were Wall Street financiers, company officials and a miscellaneous crowd of employees, attorneys and businessmen. Handled under jurisdiction of the U.S. Circuit Court, the foreclosure proceedings had been brought by the Central Trust Company as the culmination of the reorganization plan undertaken by the Morgan syndicate. Melville E. Ingalls, Jr. (son of the president of the C&O and Big Four Railroads), acting for J. P. Morgan, purchased the company for $4,000,001. Judge (later U.S. President) William Howard Taft confirmed the sale. The Hocking Valley Railway received its charter on February 25, 1899. In December 1899, the Hocking Valley acquired control of the Toledo and Ohio Central, including the Kanawha and Michigan, operating between Toledo and Charleston. In November 1902, the Zanesville and Western was added to the fold making a 1010.5-mile system. J. P. Morgan attempted to consolidate the four railroads into a single company in August 1906, but the plan fell through due to opposition by the stockholders and the courts. 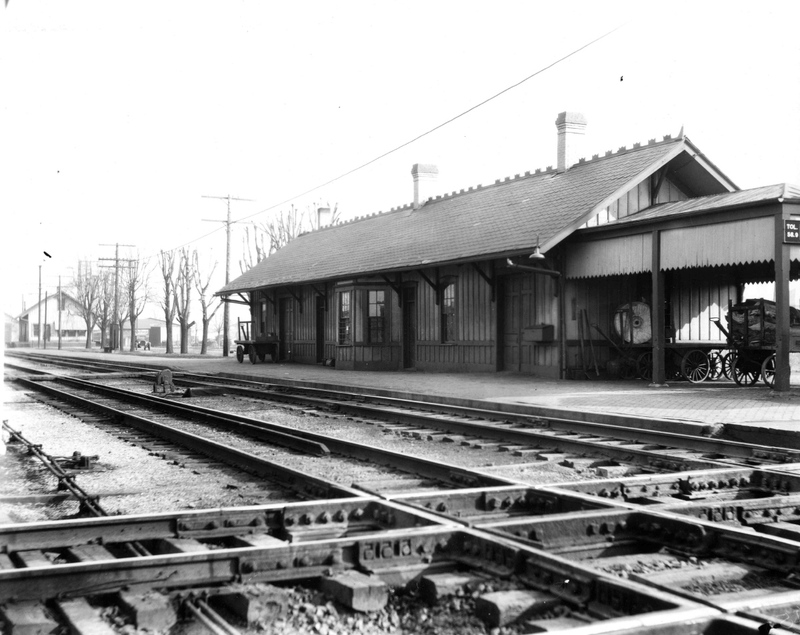 The Hocking Valley depot in Upper Sandusky in 1925. The track in the foreground is the Pennsy main line. The camera is looking northeast toward Toledo. Photo from the Edward H. Miller Collection. The Hocking Valley ordered its first 2-8-0 in April 1899. By May 1911, it would own 110 Consolidations and have retired the last freight 4-4-0 in 1906. 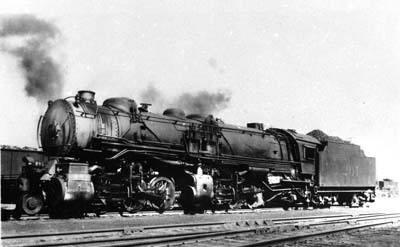 The 2-8-0's represented a considerable improvement in tractive effort over the 32 2-6-0's purchased in the early 1890's. For passenger service, the HV purchased 17 4-4-0's followed by seven 4-6-0's. Between 1902 and 1914, the HV completed double tracking virtually the entire Hocking Division between Columbus and Athens. Since so many coal companies were concentrated in the area, a new car repair shop was built at Logan in 1908. In early 1903, the Chesapeake and Ohio purchased a one-sixth interest in the Hocking Valley that it held throughout the decade. On March 10, 1910, the C&O purchased another $6.3 million of the HV's stock. This together with the stock already owned, gave the C&O just over 68 percent of the total $11 million outstanding. The C&O assumed operation of the Hocking Valley on March 22, 1910. In July 1911, the Hocking purchased the land where Parsons Yard is now located. 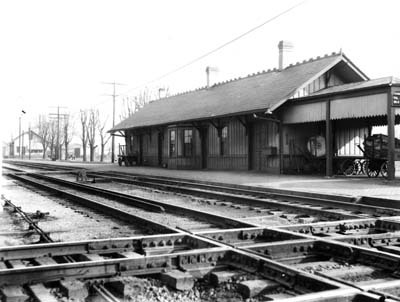 The HV and the T&OC raised their tracks through Columbus in 1911. At Toledo the HV began making plans to expand the new Lake Erie dock and the Hocking purchased an interest in the Toledo Terminal Railroad. Between March 1910 and June 1914, the C&O used the K&M between Charleston and Armitage to reach the Hocking Valley. Forced to sell its half interest in the K&M in 1914, the C&O began constructing the 29.17-mile C&O Northern between Limeville, Kentucky, and Waverly, Ohio, completing it in 1917. To reach the Hocking Valley at Columbus, the C&O obtained trackage rights over the Norfolk and Western between Waverly and Valley Crossing. Built by Schnectady to C&O specifications, the Hocking Valley took delivery of five 2-6-6-2's in 1917 followed by 20 more from Richmond in 1918. The A-1's became the prime source of motive power for moving coal trains to Walbridge. To supplement the A-1's, the Hocking purchased 16 almost new 2-10-2's from the Lehigh Valley in 1920 and 1922. A 2-10-2 had essentially the same tractive effort as a 2-6-6-2 working simple. By the mid-twenties, the 10-year contract with the N&W was about to expire. Since the arrangement was unsatisfactory to both carriers, the C&O began making plans to construct its own line. The actual work began November 25, 1926, in the face of a 10-month completion date. The construction of a 63.27-mile railroad through the rolling Southern Ohio terrain was a herculean task. The first train was able to make the trip over the line on September 16, 1927, just one day before the contract with the N&W expired. The Chesapeake and Ohio organized the Hocking Land Company in 1925 to provide for development of dock and terminal facilities in Toledo. It subsequently purchased 585 acres near the mouth of the Maumee River for $1.25 million. The task of building the Presque Isle Dock began about June 1, 1929. Both the Hocking Valley and the Chesapeake and Ohio had been leading increasingly parallel lives since 1910. In fulfillment of part of the Van Sweringen system plan approved by the ICC, the Hocking Valley stockholders approved the plan for the merger of the two companies on November 29, 1929, as did the stockholders of the parent C&O the following December 3. The ICC authorized the Chesapeake and Ohio to acquire and operate the line and other properties of the Hocking Valley, which it had long controlled through 80.967 percent stock ownership, on April 2, 1930. Effective April 30, 1930, the Chesapeake and Ohio took over all the properties, assets, rights and franchises of the Hocking Valley.